Thank you for inviting me here today to give this address. Earlier this week I struck by a report in the Belgian press which seemed rather relevant to my theme today. The headline ran; ‘How Belgium makes traffic laws – tug of war decides on traffic rules for bridge’. It seems that the small Limberg villages of Opitter and Tongerlo battled it out in an original way to decide who should give way to whom on a new bridge across the Zuid-Willemsvaart canal. The bridge being small and having only one carriage way. Villages literally had a real live tug of war to decide the rules. So we have law-making as neither an art or a science but rather as a ‘sport’; interesting! In addressing my topic I thought it might be more fun to group my remarks around three ‘P’ words as a starting point. So there will be ‘a Parliament’ – and not the one you expect! A ‘philosopher’ and finally a ‘princess’. So let’s start with my parliament. A parliament that is usually described as being Europe’s oldest, most continuous parliament or so it claims; the Icelandic Alþingi. Originating as a tenth century open air meeting where community leaders gathered, the original Icelandic settlers opposed a central state dependent on the authority or sovereignty of a lord or king in their view they wanted ‘no king except the law’. However the character I want to concentrate my remarks on is the so called ‘law speaker’ or lögsögumaður. It was he who was responsible for the preservation and clarification of the legal tradition. This character literally ‘spoke’ the law, reading out loud one third of the laws at each annual meeting, thus over a three year term going through the whole. This was a law that contained rhythmic elements and alliterative patterns to render it memorable for both speaker and listener. This was a law with resonance, a law that can speak to us, even move us as human beings. A law therefore that could command acceptance. Contrast this with EU law, with directives and regulations. Of course it can be argued that especially the former is written to ‘direct’ the national legislature. Well this was the original theory. Of course that intermediary role of the national legislator was meant to aid understanding and acceptance, yet sadly nine times out of ten it merely serves to obfuscate both the origin and meaning of the law. 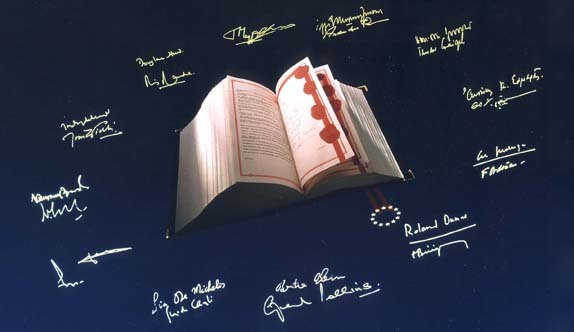 For me I can only think of one truly memorable phrase and that is from an original treaty – ‘ an ever closer Union amongst the peoples of Europe’, and that resounding phrase has sadly become politically unacceptable and accordingly had all emotion and aspiration redacted out of it. Of course the failure of EU law to ‘speak’ to us does not help the current political situation. In this connection my last months away from the Brussels bubble have been instructive for me and I would like to share a couple of examples of the problem faced by Brussels made law. In the last week there has been an interesting report produced on the future of Europe by a number of leading European national politicians, notably the German Foreign Minister Guido Westewelle. The Economist carried an article of a full page or more on Wetewelle’s report analysing how the proposals might affect the EU and its institutions. It did this without once mentioning the European Parliament. If informed media ignores the one directly elected part of the European edifice, what hope? Then as some are aware earlier this summer I trained as a mediator. My fellow students on the course in London were almost exclusively lawyers, so hopefully informed educated individuals. Yet at one point we were chatting and one remarked to me that they did not realise that Members of the European Parliament were elected! So, yes for much of Europe’s public we have to understand that EU law-making is a bureaucratic, imposed process that happens at a distance. We have to face a crisis of legitimacy the like of which the simple oral and community law-making of Alþingi did not have to contend with. Of course one could say that the scale and context is entirely different. This even without adding in the obligation for multilingualism, that is the making of law in 23 languages. One could almost say that it is miraculous that it even happens at all. Yet this does not undermine my essential point that we have a problem of legitimacy, a problem of how we communicate both EU law itself and the process of EU law-making in order to improve acceptance of the law. Of course there have been many and various attempts to go in this direction. I could mention ‘citizens summaries’: simple statements or prefaces at the beginning of EU legislation, or of course the Lisbon Treaty’s provisions on ‘participatory democracy’, ushering in the European Citizens Initiative, the right for citizens to set the EU’s legislative agenda. With that in mind let us look in a little more detail at the process of EU law-making. It may not be quite the ‘sportive’ tug of war I referred to earlier. Yet it certainly feels sometimes like a multi-directional political tug of war, certainly something closer to an art than science. To examine this process let us first turn to my second ‘P’ for some help – my philosopher. The British legal theorist Jeremy Bentham. I like Jeremy because I think his approach was one that could appeal to common lawyers and civilians alike, and indeed is perhaps a precursor of that coherence that ELI itself seeks to attain in the law-making process. I think a number of elements from this definition are worthy of comment and show how it can be equally applicable to our current European circumstances. Firstly, and interestingly, he refers to ‘signs’ so not necessarily language in the strict sense. He refers to the ‘sovereign in a state’, not necessarily a nation state. Finally I love the idea of a class of persons ‘supposed’ to be subject to the law-making process. I think this could so aptly apply to the perceived state of the EU citizen vis-a-vis the EU legislator! That is our little detour into one philosophical or theoretical description of the law-making process. It is of course a very clear definition. Yet even within this definition there is a ‘supposed’ legitimacy, a ‘supposed’ consensual relationship. What do we find in the EU process? Clearly the original European Community commanded initial consent in its founding ideals of guaranteeing peace on our continent, then continuing into the creation of the Single, then Internal Market. Yet of course it has now gone much further and deeper than that with the following Treaties of Maastricht, Amsterdam and Lisbon. The Union goes much deeper and wider in its law-making activities and despite the various national processes around each of those three Treaty changes the respect for EU law is far from clear. The law-making process even in relation to the core area of the Internal Market lacks any coherency or pattern that is visible except to knowledgeable insiders. They may understand the relationship between ends and means, indeed the Internal Market is a useful example. Historically the EU lawmaker started in many instances by attacking certain specific sectoral problems, like package travel, motor insurance, resale rights etc. Such sectoral instruments involved maximum harmonisation of laws, though more often now the talk is of minimum harmonisation. Given the appreciation of the sensitivity of overweening harmonisation of private law the EU legislator commenced with the ‘europeanisation’ of the conflict rules of private international law. Then on top of this we talk about mutual recognition and a country of origin approach which at times threatens to produce the opposite answer to the former approaches. Then now again taking another further step back from over intruding on national law we suggest ‘optional’ instruments. If you are confused as lawyers, imagine the response of the average EU citizen. I can only think that poor Jeremy would have despaired of the EU legislator! I suppose the fact that we can give a name to these various approaches or methods is something, but then let us look at the institutional process: the multidirectional tug of war. Before any legislative proposal from the Commission is directed to Parliament and Council it may well be preceded by years of pre-consultation, which of course is no bad thing. Then it may do an initial round with Parliament and Council as a White Book, before finally coming forward as a proposal for a law. Within Parliament there may be fights between responsible committees. These can sometimes be more vicious than the obvious fights between the political groups and, of course and rightly so, there will be external lobbying from interest groups. Likewise factions may form amongst the Member States and they also will be subject to lobbying. The legislative process can be, and perhaps is too often, foreshortened by a first reading agreement put together, largely behind closed doors, by representatives of each institution. Or it progresses through two public readings before potentially disappearing again into the dark art of inter-institutional ‘conciliation’ also behind closed doors. I do not believe anyone who works in Brussels would have difficulty with what I have described, but let me illustrate this with an example from the Internal Market and justice area on an issue that has long been with us and still is. It concerns the core issue of competition in the Internal Market. Competition cases generate a loss to consumers and indeed SMEs, but state bases anti-trust laws imposed by way of fines do not address that loss. They merely aim to stop the behaviour. So for many years the Commission has pursued the idea of damages actions to enforce anti-trust rules, or one could call it consumer collective redress, or to be really incendiary, the EU adopting a US style class action! Just shows how language matters! However the fact remains that this basic idea of putting the loss back into the losers hands and stopping the anti- competitive behaviour has a long and incomplete legislative history on the European stage. The period of the 2004 – 2009 European Parliament mandate saw a Commission proposal from the then Competition Commissioner, although there was an initial fairly favourable response from the Parliament, the proposal became bogged down after furious lobbying from outside interests ostensibly scared by an invasion of US lawyers. Then the idea became current that this sectoral competition based proposal was unhelpful because it did not deal comprehensively which the many legal procedural issues that were raised and needed to be dealt with by a horizontal instrument in the justice area. There were also legal wrangles as to how far Parliament could or would be involved. All this lead before the end of the mandate to the involvement of the Commission President and the complete withdrawal of the proposal. A proposal which after all could both facilitate access to justice and improve competition and so the functioning of the Internal Market. Now I hear during the course of meetings this week, that despite all the work that was done and the expectation of a full horizontal instrument on collective redress, we may within months go full circle and see just another sectoral proposal, which I will predict will most likely meet the same fate as the last one. Thus we start the same dance again. Are we witnessing a legislative system with an inbuilt sclerosis or is it rather that despite the view from the outside of the EU being bureaucratic this is just plain politics with a large and a small ‘p’? Yet, of course, the issue of the right to take collective or class action, is one that stretches beyond the European lawmaker whose decision impacts on global possibilities of access to justice. The choices made at European level in Brussels I or Rome II deny or allow access to EU courts and law to classes of third country litigants. Or the reverse happens: EU litigants, as with the Parmelat case, are forced to seek redress in courts outside the EU albeit against an EU defendant! Then within the European Union itself the UK now proposes a full ‘opt-out’ system of collective redress . What will this mean with our intra EU jurisdiction system and free circulation of judgements? Will the London courts become the EU courts of choice for EU class actions? Great for business, but a repeat of the so called ‘libel tourism’ phenomena; hardly to be wished for. My conclusion is that the EU law-maker needs help and assistance. The EU is not acting, or indeed failing to act, in a vacuum. There is an inherent failure and difficultly of moving forward in a coherent way. This is indeed very much at present a political art form in which many external lobbies play a greater role than is acknowledged in stalling progress. Let me turn to my final ‘p’, my princess. I have chosen my princess to demonstrate how the EU law-maker has failed thus far to live up to the challenge of the global world of the Internet. ‘Princess’ – well of course it was actually a duchess who hit the headlines a few weeks ago with those photos, but I guess many of us have had Princess Diana in mind. Photographs taken in one EU jurisdiction of a national of another country and, traditionally, published in newspapers and magazines in several EU countries and of course everywhere, globally, on the Internet. Does the EU law- maker have an answer for such cases? Well yes in terms of jurisdiction but mainly thanks to the court – the ECJ – and its judgements in Shevill and, more recently in E-Date and Martinez, but in terms of applicable law there is a great gaping hole, so even the court cannot help us even if it wanted to. It is ironic that while the furore about the Duchess of Cambridge was at its height I heard an interview with a British lawyer on national radio during which she said (and I quote) ‘we need a European law and a European court for cases like this’. The court of course we have, but the law, the EU legislator has been turning this around for years always in the face of a huge lobby from the press which ends in stalemate. There was of course a proposal in the Rome II regulation. The proposal came in, then was withdrawn, then we had studies, working papers and recently a final report from the Parliament, which I originally authored, but not in its final form. The lobby in respect of the press and freedom of the press is huge, but who lobbies on behalf of the balance right of freedom of personality or privacy? These are extremely complex and sensitive rights that have to be balanced, which in some countries of course also include constitutional elements. One would have thought that now the EU of itself and all its Member States are adhered to the European Court of Human Rights this could have formed a starting point to help achieve legislation balancing these rights in an adequate way. As the Parliament’s final recommendation goes directly in favour giving precedence to the law of the publisher one can anticipate that the Commission will decide to leave well alone. So once again full circle and no coherent move forward. The politics are too much. Too much in this case to allow the legislator to perform any legislative artistry. Now I have picked just two areas that I am familiar with to help illustrate the need for a little independent, informed outside help. Of course the EU law-maker can and does undertake and use studies, impact assessments and so on and now I understand in Parliament the new internal ‘health checks’ are all the rage. This is all to the good, but could not also an organisation like the European Law Institute help? I, of course, was present at one of your early and embryonic meetings in Florence. I think I may have irritated some by my scepticism. Yet as a parliamentarian I think you will understand I was jealous of the democratic process that has been so hard won at European level; whatever its flaws. However, as a lawyer and a citizen, I am frustrated by what I see as the failure to connect and communicate European legislation in a coherent way as it makes its stop-start winding way towards delivering simpler access to justice. There can be no doubt that the current political climate is hostile, tough one for politicians. By contrast your work on contract law, on the CESL, is careful, detailed and technically informed and produces a document that is progressive and ambitious more so than Commission or Parliament. So much so I understand there has already been a question from a British Tory MEP enquiry how much you were paid by the Commission! Yet as a grouping of eminent individual professionals and academics your independence is without question. I hope you will see from this little discourse established around a parliament, a philosopher and a princess, the irony of what I have described to you. Here we have an EU lawmaking process that is perceived as distant and labelled as bureaucratic, yet the reality is that it is highly political, and that securing new legislation is a highly political art-form with a large and small ‘p’ . Despite all that I still believe the EU does within all these constraints an amazing job, but there is no doubt that the European Law Institute could help introduce a little legislative science into the process.